Day 3 of my Seven Michelin Star Restaurants in Seven Days series brings us to Sushi Azabu, a traditional edo-mae style Japanese restaurant. Edo-mae sushi is a combination of fresh raw fish, and cooked rice which is seasoned with vinegar, pretty much the sushi that you've come to know and love today. However, don't expect to find California rolls or anything of the sort here. Sushi Azabu is located in TriBeCa, tucked away underneath the basement of Greenwich Grill. So, when you first come looking for this gem, don't expect to find a sign for Sushi Azabu - just go into Greenwich Grill and you'll be directed to the stairs where Sushi Azabu is hidden. Sushi Azabu is actually quite small so making a reservation by phone is recommended. Also note that right now, due to the aftermath of Hurricane Sandy, they are only taking parties of 4 or less and there's limited seating on the booth tables. The counter seating has been reopened, so go ahead and book a reservation to try their Chef's Omakase or other delicious sushi today! 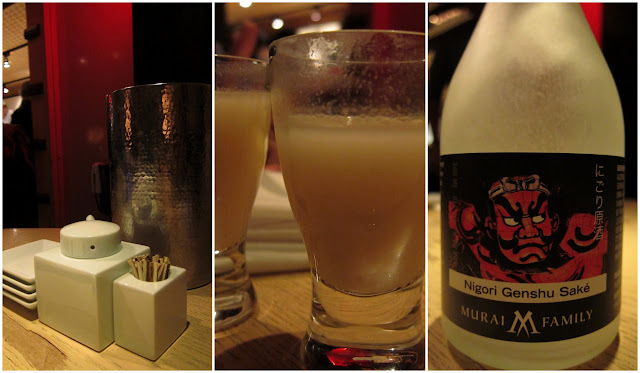 Unlike a lot of other sushi restaurants, I really liked how easy going Sushi Azabu felt. Since they only serve a certain amount of people per night, it will never feel overcrowded or hectic. It was a great place for me and my party of 4 to enjoy a night of good food and conversation. So to kick off dinner, we actually decided to not do the Chef's Omakase, but instead we ordered some Japanese small dishes, all were so delicious. Finally, we had the Koi Course, easily the most affordable, bang for your buck, thing you can order here. which consisted of 10 pieces of nigiri - eat prepared with a dab of wasabi and a light coat of soy sauce brushed on top of it. As I was enjoying each bite, I was having a slight Jiro Dreams of Sushi moment. Side note: If you haven't watched the movie, I suggest you do! It definitely gives you more appreciation of the work that goes into a perfect piece of nigiri. As we were grubbing on the nigiri, we were also given their delicious miso soup which was served with a shrimp head. This was unlike any other soup I've ever tasted as the shrimp added some sweetness to the broth, and you bet I slurped up the shrimp head afterwards! After our delicious sushi, we ordered their Matcha Meringue dessert - Green Tea mousse with Bananas and Strawberries. It was so light and fluffy and delicious to eat. Overall, I really enjoyed the dinner we had here. It's a clear winner as a 1 Michelin Star Japanese Restaurant - not only is it affordable but the ambiance and food is enough to coax you into a relaxation and happiness.